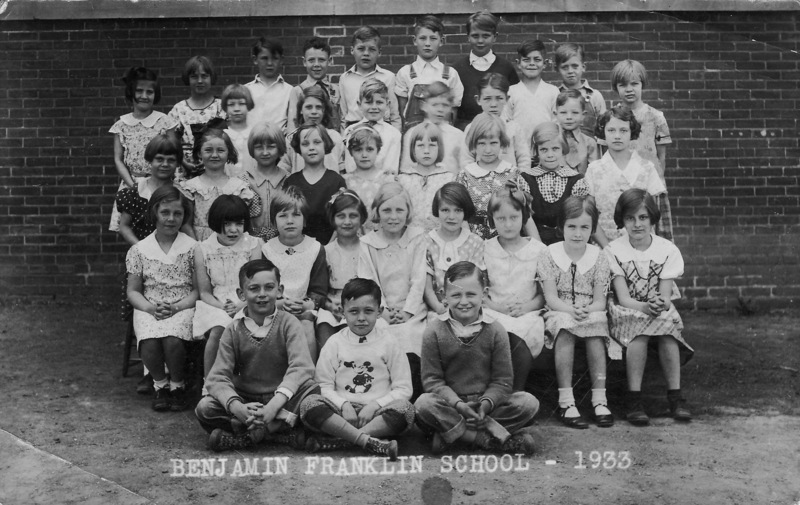 These children attended first grade in 1933 during the Great Depression. Even though money, food and jobs were scarce, they still obtained an eduction. When they graduated from high school, the Depression lifted as the United States entered World War II. Then came rationing to support the war. After the war, they created the American middle-class: home ownership rose, poverty declined. Later in life, these children would be known as the Greatest Generation: resourceful, humble, hearty. Not only did they survive enormous challenges of economic disparity and war, they created a prosperous society. These first graders were our greatest hope for a new age. And they still are. So, if any one has information or knows the story of a child in this photo, please share the story. A family historian, writer, reader of mystery, and traveler to all place far and small. This entry was posted in Families Remembered, Wiedeman and tagged 1933, Franklin Elementary, Great Depression, Old school photos. Bookmark the permalink. Beautiful picture of the greatest generation. Thank you. Yep, my Dad is in this photo, I was hoping to find any of his classmates. Would love to hear their stories. I’ve been enjoying your site and I shall be back again. Reblogged this on karin boutall. © Karin Wilson and Real People Real Stories, 2013. Unauthorized use and/or duplication of this material without express and written permission from this blog’s author is prohibited. Excerpts and links may be used, provided that full and clear credit is given to Karin Wilson and Real People Real Stories with appropriate and specific direction to the original content.